Go to main travel page. Go to home page. Although we've been to Australia several times together (Christine being a Sydneysider), we'd never managed to get to the smallest state – Tasmania. In an earlier lifetime, Christine had spent about 18 months there, initially as the caretaker of a National Trust property, then becoming the French mistress at a girls' school – a "ladies' college" – in Launceston, the big country town in the north of the state. She'd never been back. As we were to land in Sydney, and wanted also to travel through Victoria and spend a few days in Melbourne, we decided to take the overnight train from Sydney to Melbourne, then go back and forth to Tasmania by car-ferry. There were two ways to go – an expensive catamaran that took most of the day to cross the Bass Strait and docked at Georgetown at the mouth of the Tamar River, or a traditional car-ferry that would provide us with a cabin overnight, a dinner and a breakfast, and a chance to sleep away the last of the jet lag. Our decision to take the latter, the Spirit of Tasmania, was sealed when we discovered on the Internet a company called Rent-a-Bug, based in Devonport on the northern coast of Tasmania where the car-ferry docked. The site's map showed its location, about a block from the waterfront, an easy hike with the luggage. An exchange of emails secured us a VW for our arrival date. Why, you may reasonably ask, did a Beetle hold such appeal for us? Partly because I'd had a 1969 one when we met, and in fact had owned and rebuilt a couple of others, too, as well as a VW microbus. Converted into a Baja Bug, the '69 had made a passable attempt at overland travel on Baja one December in the late '70s. But after nearly two decades of modern cars I retained little of the memory of actually driving Beetles, beyond the sense that they were noisy and had a distinctive smell. Renting one seemed a nostalgic thing to do and, after all, Tasmania is a relatively compact island, with none of the marathon driving typical of much of Australian touring. The Spirit of Tasmania was a comfortable ship, with a reasonable dining room and small cabins incorporating even smaller bathrooms. On the wall, below a list of what ought not to be flushed, was a sign: "Test Water Temperature With Hand Before Entering Shower." Some of the easy-going passengers looked like they needed that sort of advice, including the ones who lined up to get their photograph taken with Tigger (pronounced "tigg-ah! "), a small tourist-board employee in a mangy-looking Tasmanian tiger suit. Many passengers also took the opportunity to purchase a photograph of their car driving onto the ferry from display boards outside the on-board one-hour photo lab. After an hour or two the sea began to look the same in every direction, as it is wont to do, so we retired to bed, avoiding the lounge with its Barry Manilowesque piano stylings and slot machines. We awoke to the Tasmanian coastline silhouetted in the dawn light, and were soon entering Devonport's narrow harbour. A few streets of small bungalows with tidy gardens lined one side of the harbour, while ahead the sheds and wharves of the commercial port created a more nautical clutter. Visible in the raking sunshine was one building with a strange object on its roof. As the ferry slowed to a halt and began to manoeuvre itself against the wharf, I suddenly realized I was looking at a Beetle, welded at a 45 degree angle onto an iron frame like a tactical missile about to be launched onto a battlefield. Rent-a-Bug occupied a dusty, concrete-block building with a side driveway leading to a garage where a number of Beetles and other very experienced cars reclined in various stages of repair. The attendant, a lean woman of about 50 with hair like straw and skin like leather pointed to a blue Beetle in the driveway. "That's yoahs," she said. "It's moi fyvorite – the last one we've got with a flat windscreen." "Is it a '69?" I asked, thinking it looked familiar. "Yis, that's roit," she muttered, without looking up from the paperwork. "The only problem is the tuhn signal is on the left soide. Othahwoise it droives like a noahmal cah." It of course was right-hand drive, but Volkswagen of Australia had evidently not bothered rearranging the controls on the steering column. This was a relief, as the last thing I was able to get used to, whenever we were in a drive-on-the-left country like Australia or England, was the location of the turn signals. Inevitably as I approached a corner or commenced to change lanes I'd make the wipers flap, adding to my general confusion as I tried to remember which side of the road I was supposed to be on. With the Beetle, of course, the wipers were controlled by a pull switch on the dash, as were the headlights and . . . well, that's all the controls there were. It was so simple -- I had forgotten that a VW driver had only the two idiot lights, the one on the left for the generator (which meant the fan belt and thus the engine's temperature), the other for oil pressure, and his senses of smell and hearing, to tell him how his beast of burden was performing. Indeed, if the oil pressure light came on at speed, it only provided official confirmation that the engine had fried. I climbed behind the driver's seat, rattled the gear lever to make sure it was in neutral and noted its familiar clock-clock sound as it moved back and forth in the gate. I turned the key. The starter whirred for a second and the engine fired, that combination of fan and valves and exhaust -- an air-cooled sound -- that was right there, more immediate than any modern mechanical thing. I was 25 again. Christine climbed into the passenger seat. My hand on the gear lever was an inch from her knee. I'd forgotten how narrow VWs were. No wonder there was so much romance, but with the size of the back seat all but the contortionists ended up in motel rooms. I eased forward along the Rent-a-Bug driveway, bumped through the deep gutter designed to carry away the monsoon rains, and accelerated around the corner and up the hill. No clutch-slipping at all. Somewhere from the back of my memory I recalled that low gear is 3.98:1 -- a real stump-puller. About 15 mph, pulled straight back into second, and felt the revs dive. The gears are so far apart. Up to third--too soon--so shifted back to second, pulling the lever back and away--the hardest shift to execute for a North American on a right-hand-drive car. Within a block or two it had all come back: the light steering, the sound, the smell, the lack of performance. Soon we were out in the Tasmanian countryside, on a quiet paved road, humming along at 45-50 mph, the no-drafts swung all the way around to blow the dry outside air right into our faces. Driving notes for a '69 Beetle: it pinged like a computer hard-drive loading a big program, regardless of the octane of the gas or the steepness of the hill. It had so little torque it had to be rowed up hills with the gear lever, but it was light and extremely manoeuverable, a breeze in city traffic, and fun on winding roads with its enthusiastic tendency to oversteer. As the Tasmanian roads were littered with roadkill -- a horrid bestiary of mangled wallabtes and wombats who die in droves crossing the roads between dusk and dawn -- the fast steering helped. How about the brakes? Yes, there were brakes. The other roadkill was airborne. The windscreen became almost opaque after a few miles -- big white moths that splashed a yellow streak across the flat glass -- impossible to clean with the wipers and washer, operated by the pressure from the spare tire located in the (front) trunk. As we had signed a form stating that travel on dirt roads would void the insurance, we could not drive in that venerable VW way where you need only keep the side windows clean to see where you're going. The lever for the front trunk latch was inside the glove box. It worked, but the latch for the glove box itself fell apart. Fortunately, we had a bunch of lavender, acquired in an antique shop, jammed into the space between the glove box lid and the grab handle to keep it shut. The wind noise, especially at speeds above 50 mph, was stupendous. There was no internal ventilation system and it was hot, around 90 Fahrenheit or 30 Celsius, so we had to have the windows rolled down, and the car drummed and moaned the way a beerbottle does when you blow across its top. How did we ever love these cars, we asked ourselves? Youth and poverty and a desire to be cool -- that about sums it up, plus the fact that most of the domestic cars in the 60s and 70s were like boats, needing a JC Whitney Suicide Knob on the steering wheel to whip around tight corners. Christine's road-test comments? "Been there done that." From Becca Robson, 2009: I am currently doing my Fine Art A-Level Course at Mildenhall College of Technology. The topic we have been working on is based around Freedom, and whilst researching this i have come across your work. 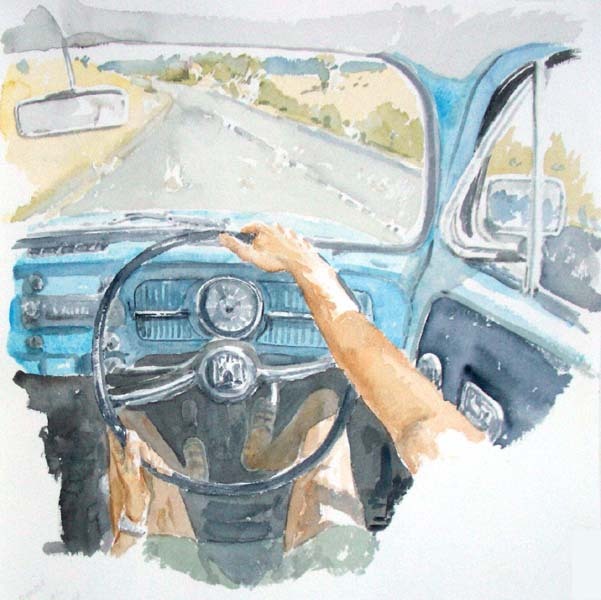 I especially enjoy your paintings based around travel with the cars. My favourite would have to be 'Through Tasmania by Beetle' with the image of the painter, you, looking outside the car from the inside. This painting has inspired me greatly because my idea of Freedom is to be able to drive wherever i please and just enjoy what is around me. First stop was Launceston, following a leisurely ramble through the rolling, rather English countryside south of Devonport. From a list we'd compiled from a Tasmanian B&B site, we checked out several large heritage houses that had been converted to inns, but found them either full or too deluxe for the Beetle budget. With good fortune we happened upon the Canning Cottage, a semi-detached hipped-roof Georgian house on Canning Street. 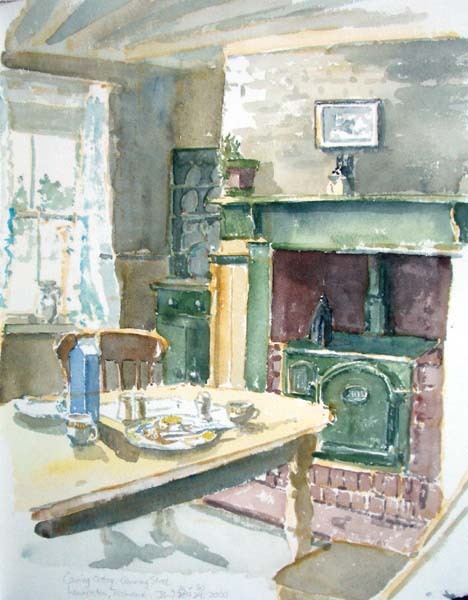 Built in the 1820s for British soldiers who were garrisoned in the town (Tasmania then being a penal colony), it was very spare, each side having a front parlour, a kitchen-dining area (shown here) that had since been fitted with an iron stove in its hearth, and two small bedrooms up a narrow, steep staircase. At some point, probably a century ago, a shed-roofed kitchen addition had been added to the back, followed, roughly a half-century later, by another shed-roofed bathroom addition bringing the plumbing indoors. We stayed a few days, explored Launceston (including its summer festival in the main park) and its surroundings, venturing as far as the Bridestowe Lavender Farm near Scottsdale. Good pizzas, local wine, take-away barbequed chook, and Cecilia Bartoli on TV late one night in the Marriage of Figaro. The bridge at Ross, an historic central Tasmanian town with a number of well-preserved buildings and sites, including a women's prison. The sandstone bridge was so beautifully built with such splendid decorative carving that the convict masons were pardoned. A description of central Tasmania, penned by the Irish political prisoner John Mitchel in 1850, appears in Robert Hughes' The Fatal Shore: "At one o'clock up comes the Hobart Town and Launceston day coach, which is ... precisely like what an English stagecoach was before the railroads had swallowed them all up. The road is excellent, the horses good. The coachman and guard are in manners, dress and behaviour as like untransported English guards and coachmen as it is possible to conceive. Even the wayside inns we passed are thoroughly British, even, I regret to say, to the very brandy they sell ...." Today, the overlay of republican Australia--the newspapers and the meat pies--in every shop, as well as the Coca-Cola and video signs, makes Tasmanian towns hard to distinguish from elsewhere in Oz. The Norfolk Convict Station, an historic transiting point and provisioning station converted into a B&B near Port Arthur, the extraordinary, not-to-be-missed former prison on the Tasman Peninsula. A most evocative place, not far from Eaglehawk Neck, where ferocious dogs were chained across a narrow spit of land to ensure no convicts escaped. The only alternative was the shark-infested sea, including Norfolk Bay in the distance. 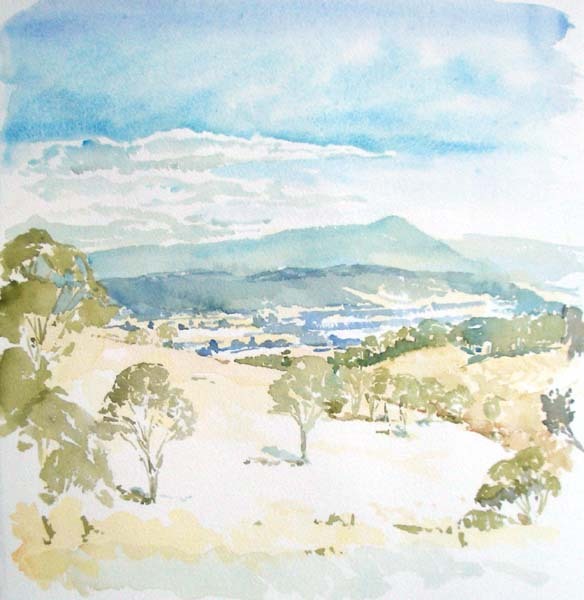 Classic Tasmanian countryside, painted from the roadside in the rolling hills east of Campbell Town. On previous trips to Australia, I had always failed to capture the colours and light, a peculiar combination of the dull and the bright, an intense sunshine that somehow doesn't manage to cast deep shadows. This time I painted only with four colours (all Holbein): Cadmium Yellow Deep, Olive Green, Ultramarine Pale, and Manganese Blue, plus a little Payne's Grey in the middleground. 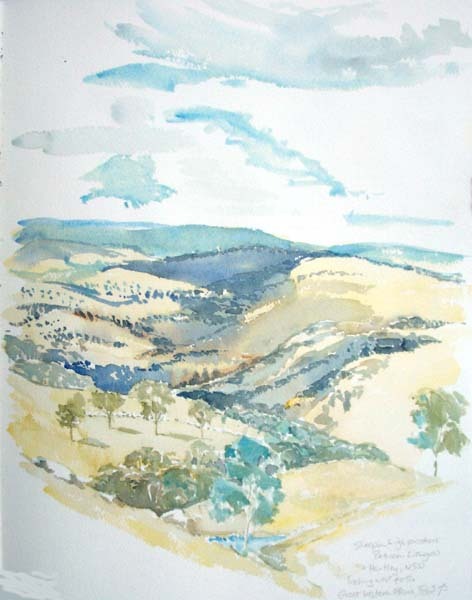 On the way back to Sydney, on the western edge of the Blue Mountains, stopped by the roadside between Lithgow and Hartley to paint the view looking towards the Great Western Plains. The clouds threw deep ultramarine shadows in patches on the ochre hillsides; a flock of sheep (the little white dots) decorated a nearby hillside.